Glendon Mellow at The Flying Trilobite tells us that there’s a white squirrel living in Trinity-Bellwoods Park in Toronto. It’s an albino. Visit his blog for pictures that he took. 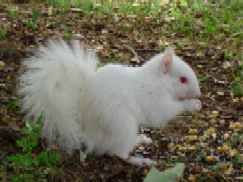 According to the Urban Decoder, albino squirrels have been seen around the park since about 1985. Someone else has reported an albino squirrel at Woodbine & Danforth in Toronto. The image at right is a white, non-albino squirrel. 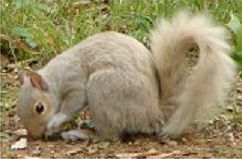 Please look at the Wikipedia entry for “squirrel” for information about colonies of albino squirrels. Trinity-Bellwoods Park (http://www.toronto.ca/parks/parks_gardens/trinitybellwoods.htm) is listed as being at 1053 Dundas Street West, but it’s better described as being at the junction of Queen Street and Strachan Avenue. It’s the original site of Trinity College (now on the main campus of the University of Toronto). The course of now-buried Garrison Creek runs across (or under) the park. Where Crawford Street crosses the park’s northwest corner was actually a bridge over the Garrison Creek ravine; if you look carefully you can see it’s a buried bridge, not a normal street. In summer, I wondered how the little one in Trinity-Bellwoods would make it; surely it was chased by dogs, and amateur photographers far more often? Now, after seeing it against all the snow we’ve had in Toronto this year, it’s almost perfectly hidden from casual glances. Hard to picture a bridge right there on Crawford, Mr Nelson! I believe you if only for all the metal “Garrison Creek” logos pounded into the sidewalks in the area. There’s one on my street too. Seemed to be quite the creek system. Legend has it that Garrison Creek runs through the second sub-basement of a building on the U of T campus, so that if you open the right door, you can see it! Search for Toronto +”lost river walks” if you want to find out more about the buried streams in our city.